We can only directly observe about 4% of the universe, and the other 96% is assumed to be divided up among dark matter and dark energy, which we have still not identified. Once identifying these invisible components of the universe, we may be able to take a step closer to understanding the origin of the universe. 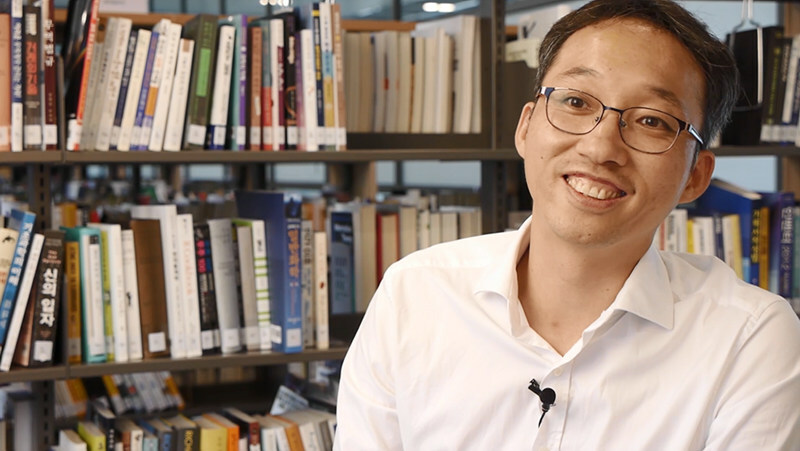 IBS Center for Underground Physics (CUP) research fellow HA Chang Hyon spoke to IBS People about how he got into the world of dark matter and what he envisions to achieve at IBS. ▲ Ha’s research investigates weakly interacting massive particles(WIMPs), one of the most promising dark matter candidates. There are a number of indications that dark matter exists, such as gravitational lensing. Cosmologists found the path of a beam of light in space, which seemed to be "empty", is bent, leading to the conclusion that invisible but yet massive matter causes a distortion of the light’s pathways. HA investigates weakly interacting massive particles (WIMPs). WIMPs do not emit nor absorb light and interact with other forms of mass only through a weak force or a gravitational force. These characteristics make WIMPs promising dark matter candidates. "In the beginning of our search for dark matter, there were so many candidate particles. It was like looking for a needle in a haystack. Thanks to the accumulated knowledge by researchers from around the world, dark matter candidates have been shortlisted. I am quite confident to say the WIMPs are one of the strongest dark matter candidates," said Ha. Even as a child, Ha thought it would be fun to engage in what others would have not experienced. He researched solid-state physics during his early Ph. D. degree period but did not find it very unique. It was particle astrophysics that intrigued Ha. Though there were few Korean researchers in the field at that time, Ha went into particle astrophysics and spent 8 years for his Ph. D. and postdoctoral fellowship studying for neutrinos in the IceCube experiment which was built at the South Pole. The IceCube neutrino observatory observes the elusive particles in a cubic kilometer of clear Antarctic ice with 5,160 digital optical sensors. When a neutrino comes in contact with a nucleus in the ice, other particles shoot off. When they exceed the speed of light, they emit visible radiation (dim patterns of bluish Cherenkov light), which can be picked up by some of the sensors. Based on the brightness, timing, and location of the light, researchers can reconstruct the neutrino’s path and energy. "It was meaningful work, but in the meantime I became very thirsty for more hands-on experimental research after 8 years analyzing data from the IceCube detector," added Ha. Ha will accelerate his research using CUP’s new detector in the Astroparticle Research Facility in Jeongseon County in Korea. In addition to its Yangyang laboratory located underground below 700 meters, in August 2018, CUP began to build the Jeongseon laboratory below 1,100 meters underground which is expected to be five to ten times more precise in its detection capability. However, why should the facility be built underground? "An underground laboratory keeps background radiation from cosmic rays, such as muons, out of an experiment. These background radiation sources can easily drown out the signal of other interesting particles. Going deeper, more "noisy" radiation gets eliminated," said Ha. Ha conducts two types of experiments: COSINE dark matter experiment and AMoRE neutrino-less double beta decay experiment. COSINE is a dark matter detector that is made of light emitting crystals. It takes data by reading energy deposited when a dark matter particle hits the detectors. Since crystals allow the particle-induced light to easily propagate, they are conducive to improving the sensitivity of the detectors. While searching for traces of dark matter via the COSINE experiment, Ha also conducts neutrino-less double beta decay experiments called AMoRE to get closer to the mysterious birth of the universe. In an ordinary double beta decay, which has been observed in several isotopes, two electrons and two electron antineutrinos are emitted from the decaying nucleus. Conversely, in a neutrino-less double beta decay, only electrons would be emitted. It is a hypothesized process that has never been experimentally observed. "If we are able to detect the neutrino-less double beta decay, we may get a better understanding on the formation of the universe. If the universe were equally composed of matter and antimatter, it would have contained nothing after the two extremes offset one another. It is supposed that the asymmetry of matter and antimatter in the early universe may have led to the existence of material or life." ▲ Ha with his colleagues. People are the key drivers in particle astrophysics that requires large-scale experiments. "Most large-scale experiments in particle astrophysics are led by countries other than Korea. I would like to see visionary dark-matter detection experiments independently operated in Korea resulting in collaboration offers to researchers overseas. That would be an indication that Korea is leading in particle astrophysics," Ha said. ▲ "Three-Way Dark Matter", a sign on the window of Ha’s office. Ha believes people are the driving force to keep his research going. Experiments with large scale facilities require collaboration and discussion with people from around the world. Such interactions move forward efforts to make discoveries about the universe. This explains Ha's enthusiasm to reach out to the general public. "I have high expectations for the IBS Astroparticle Research Facility at Jeongseon County that is currently under construction. Jeongseon is a typical remote town that does not have an easy access to good science education or public engagement programs. With the opening of Jeongseon laboratory, I would like to give back to the community by organizing fun and educational science events in the area." Ha makes an analogy of dark matter to one of the most elusive, massive sea creatures; the kraken. As the most innovative techniques need to be employed to get a glimpse of the kraken in the deep sea, the hunt for dark matter also requires sophisticated detection techniques. Ha’s passion and spirit have led him to go his own way to explore a new frontier. He longs for the day when the elusive dark matter finally is observed in the detector, much like when kraken is finally captured on camera.